There were many types of gladiators in ancient Rome; each specialized in different weapons and tactics. Gladiators only fought others from the same troupe, although sometimes particular gladiators were ordered to fight others from different troupes. They fought barefooted and under strict rules. Bestiarii or beast fighters were people who were closely associated with wild beasts and animals of the arena. 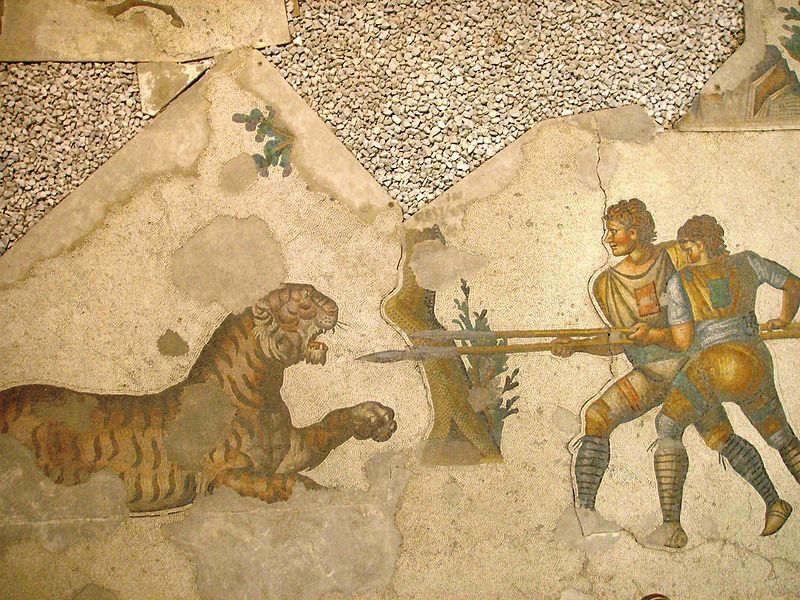 The name was given to those who trained and looked after wild beasts, gladiators who specialized as wild animal fighters and also to criminals and prisoners of war who were executed as criminal by being thrown to the wild beast. 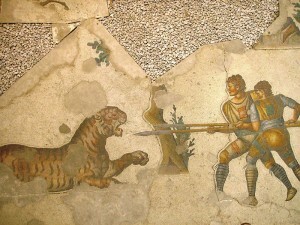 The gladiators’ opponents were wild animals such as leopards, lions and tigers. 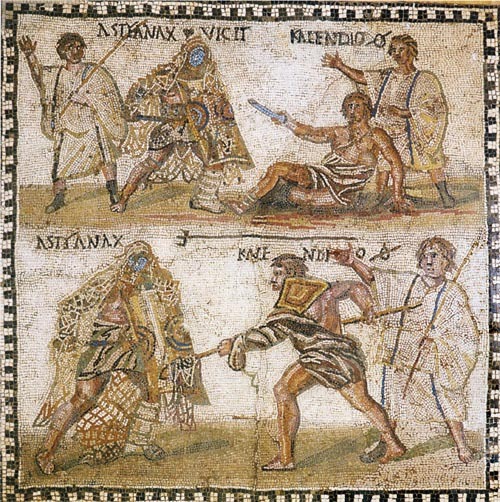 The weapons used by these gladiators include: a spear, a knife and occasionally a whip. The gladiators also wore a visored helmet called the Galea, which was decorated with crests and basic leather legs and arm wraps. In addition, Bestiarii safely confronted wild animals in the arena from a spherical iron cage called Canistrum. 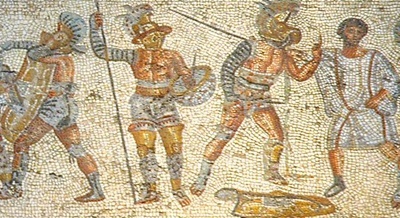 Andabatae gladiators are also among the most famous types of gladiators. These gladiators were sight restricted gladiators who wore helmets without any opening for the eyes. They had to tight blindfold which excited the delight of the viewers. Andabatae fought with hapless criminals only, with a sword as the only weapon. They also fought with bare chests, although they wore body armor and a helmet with no eye holes. Sometimes these gladiators fought on horseback. Generally, they were hapless criminals who provided comic relief to the spectators. Mirmillones used a helmet that covered their head completely. They used the gladius, a Roman-style short sword, as a weapon. In addition to that, they were given an armguard, a large oblong shield, and a shin guard. The shields offered a large barrier between Mirmillones and their opponents to block the attacks. However, the shields were heavy and therefore made the fighters to be very slow and get tired in long fights. These fighters carried a trident, a net and a dagger. They also wore a loincloth, which was held in place by a wide belt, and an arm guard called manica, which extended to the shoulder and left side of the chest. Their fighting strategy was to entangle their challengers in the net and finish them with the trident. In addition to that, the retiarii stood on a raised platform with stairs while having a pile of stones to throw at his opponent. Generally, they fought secutores gladiators and sometimes Mirmillones. Hoplomachi gladiators were well built and heavily armored gladiators. They fought with a gladius which was 27 inches long. This sword was designed to thrust and parry, rather than cut and slice. Hoplomachi also carried a lance called hasta, which was six feet long. In addition to that, they wore a Galea visored helmet with a heavy crest ridge. The right arm is protected by a manica of tied leather, while the lower left foot was protected by a metal greave. They fought with similarly armored gladiators, however; due to their heavy armors, their fighting speed was slow. These types of gladiators entered the arena mounted on horses and started to fight on horseback. As a rule, if one fell off from his horse, the opponent had to fight on foot too. Occasionally, they would dismount after sometime, if neither of the fighters had won, to continue the combat on foot. They fought with a lance or a short, light throwing spear called verutum, and a gladius or a long straight sword with double edge called spatha. They used a medium sized, round, cavalry shield called parma equistris or a big oval body shield called Clipeus. They also wore Galea and manica. Eques were always the first to fight during a scheduled day of gladiatorial games. Dimachaerus (dimachaeri in plural) were Roman gladiators who fought using two swords. They usually fought against heavily armored gladiators such as Mirmillones or Hoplomachi. The used two curved swords called sica or siccae, which had a blade of about 16 to 18 inches. Sometimes they also used the gladius as a weapon. They did not use a shield, although they wore a light visored helmet which fitted the head tightly. Their legs and arms were protected with leather wrappings. Dimachaerus had skills and ability to wield a sword with both hands. They were skilled archers equipped with short, powerful war bow of the Barbarians who lived in current Russia and Ukraine. When they fought, the arena was filled with bushes, rocks and trees to give cover to the fighters, forcing them to stalk each other through natural scenery. Generally, they participated in mock battles reflecting Roman victories against noxii gladiators. They did not use any shield, but they wore a scaled armor and pointed helmets. This is among the most popular types of gladiators. They carried a small square or rectangular shield which was made of wood. The shield was small in size and offered little protection below the groin. This is why the thraex wore greaves and ocreae on both legs, which reached the mid thigh level as a form of leg protectors. They also used a sica, which was intended to wound an opponent’s unarmored back. Moreover; they wore a protective belt above a loin cloth and a helmet with a side plume. Until the mid first century AD, Venators were heavily armed with large shields, greaves and helmets. In the late first century AD, they are described to wear only a tunic and armed with a spear only. Essedarius gladiators are a type of ancient roman gladiators who fought from a chariot. The chariot would have one man only or a fighter and a driver. Provocatores which means challenger are a type of gladiators who challenged other Provocatores on a fight. They fought with the gladius, while using a rectangular, semi-cylindrical body shield. Their helmet did not have a crest, which made them to be distinguished from other types of gladiators. They also wore a small chest plate called Spongia, which was made of a single piece of metal covering the chest. i wanted to know what kind of gladiator Spartacus was. @Jaida the subheadings are the names for different types of Gadiators, If you read the descriptions they would enlighten you on the armour worn by each one. If you’re looking for a more broad answer, they wear different armour because each type of Gladiator has a special fighting technique which requires certain armour. I want to find a really good gladiator!!!!!!!!!!! !any ideas????? ?